Are you searching for a skinny ankle pant by NYDJ that's fitted like a legging and done up with fashionista details? Look no further. 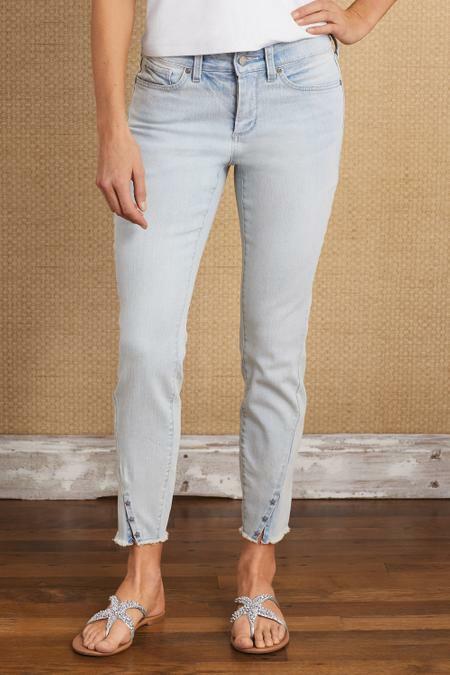 This woven-denim legging has the style cues of your favorite jeans (zip fly, belt loops, 5-pockets) along with a lighter summer wash, raw hem, and a seastar metal-rivet embellishment at the ankle. Cotton/Poly/Elastane. Misses 28" inseam. Sits just below natural waist.